The Flying Buzzard is a 105 ft. ocean going steam tug and is the last surviving vessel of her type. She was built in 1951 by Ferguson Brothers of Port Glasgow for the Clyde Shipping Co. of Greenock. The prefix 'Flying' was used on a succession of tugs belonging to Clyde Shipping, dating from 1856. In 1951 there were a further nine boats with 'Flying' in their name belonging to the company, and two earlier ships had been named Flying Buzzard, built in 1895 and 1900 respectively. Two other boats were built in 1951 as sister ships to the Buzzard, the Flying Merlin and the Flying Petrel. These three were the last steamships to be built for the Clyde Shipping Co. by Ferguson Brothers. The Flying Buzzard was launched on 21st May 1951 in Port Glasgow Outer Harbor. 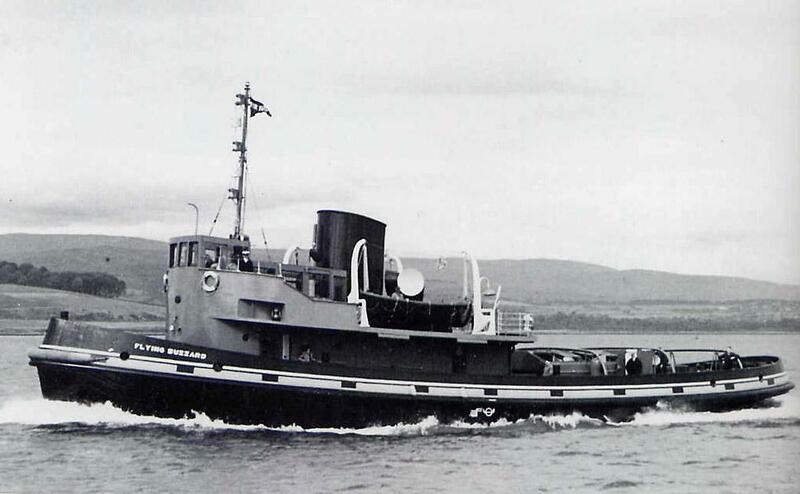 Flying Buzzard was employed mainly as a tug, but she had a secondary purpose as a tender to the passenger liners which, at the time, travelled to the Clyde. The passengers would disembark onto the Buzzard and be taken safely up the Clyde to Glasgow. Her passenger certificate shows her to have been allowed 150 passengers. First class clients would have travelled in the passenger saloon on the upper deck, abaft the bridge, with the rest of the passengers being spread about the two open decks, which offered little protection from the Clyde weather. The Flying Buzzard had been in operation for less than a year when, in April 1952, disaster struck. The Buzzard, together with her sister ship the Flying Petrel, were towing the 9,819 ton tanker Esso Appalachee from the discharge berth at Bowling to the Tail-of-the-Bank, when the tanker fouled her tow, sheered and struck the Flying Buzzard amidships. The tug started to go down by the stern, her engine room flooded, and there was immediate danger of her sinking mid-channel and blocking the busy shipping lanes of the Clyde. Her commander, Captain Cameron, steered for a sandbank opposite Dumbarton, where she sat, submerged in 26 feet of water. Luckily the crew managed to disembark without mishap. Despite the damage to the Buzzard, it was considered that there was a good chance of her being salvaged. She was re-floated on 23rd May and taken to Lements Repair Yard in Port Glasgow. By 6th October she was back in service and returned to work on the Clyde, where she remained for the next eleven years, working as a tug and tender. In 1963 she was sold to Dundee Harbour Trust and re-named Harecraig II. After a long career, the tug was sold in 1983 to the Treloar Bros. for preservation. In 1986, following non-payment of harbour fees, she was sold to the Maryport Steamship Co., and made her own passage from Newcastle to Maryport. The Flying Buzzard (along with the VIC 96) were subsequently taken over by Allerdale District Council as the basis for a steamship museum located at Elizabeth Dock. In 1996 ownership was transferred to the Friends of Maryport Steamship Museum (a registered charity), who provided nominal maintenance and used her as a floating exhibit. In 1998 she was registered as a historic vessel by the National Historic Ships Committee and became a member of The Historic Fleet of the United Kingdom. The Flying Buzzard and the VIC 96 were sold to the Workboat Preservation Group in 2002, for a nominal sum of 50p each. In the summer of 2003 the boilers were removed due to damage and deterioration, effectively ending any hopes of her working again under steam.